Hey guys, (and girls) I've gotten a lot of really nice comments over the last few days on my recent work, and the new store set up, so thanks to everyone for taking the time to email. 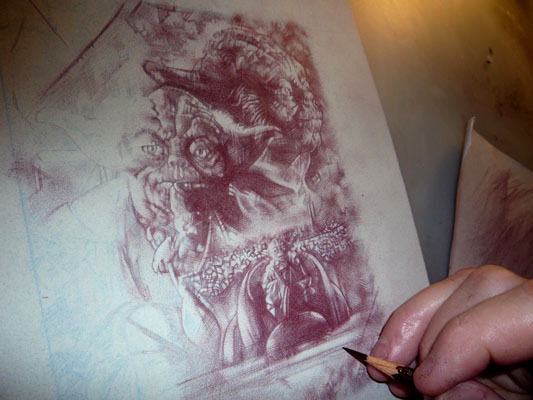 The new Yoda piece is coming along nicely. As I said last Friday, the over all piece was designed by David Deb - Link It's a funny thing, when I started doing this one, I almost found the design a little uncomfortable, (I think just because its not my own) but as the drawing has progressed, I've really changed my mind and fell in love with the way its coming out. I'm such a solitary artist, I never collaborate with anyone anymore, but this project is giving me a little insight into the way David works. Its pretty cool.